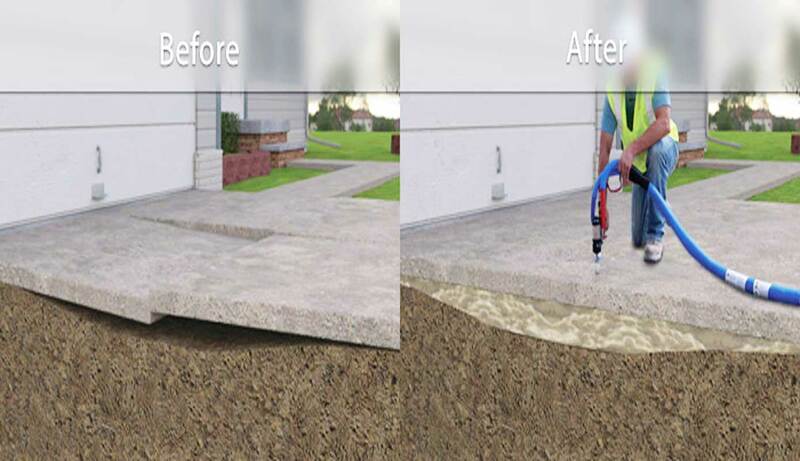 Concrete levelling, commonly referred to as “slabjacking”; is the process of either raising concrete slabs or filling voids under them, or both, by pressure injecting polyurethane spray under the slabs. Any residential or commercial concrete slabs. Advantage Insulators concrete levelling solutions are designed for optimum lifting efficiency and typically far less total pounds of polyurethane foam is required per job, compared to other levelling foams used today. Our slabjacking solutions are approved by many Departments of Transportation, Departments of Public Works, and local municipalities. Economical: Polyurethane foam solutions in many cases eliminate the need for expensive and time consuming concrete replacement. Efficient: Compared to grout levelling methods, there is no need for oversize ed core holes which can range from 1.5” to 3” in diameter. 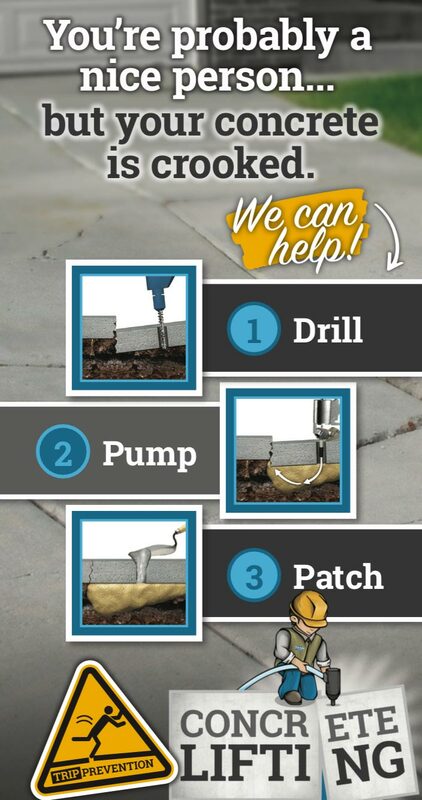 The foam levelling method requires a 5/8” diameter hole which eliminates unsightly patches and, since foam cures in minutes, there is no discoloration or staining of the surrounding concrete surface. Rapid Application: Because polyurethane foams cure in minutes (typically 90% of full compression strength in 15 minutes after being injected) large surface areas can be lifted and reopened to use reducing downtime and labour cost. Moisture Tolerant: Specially formulated polyurethane foam system can be injected into wet areas while still maintaining its physical characteristics during reaction and expansion. Moisture Resistant: The high density, closed cell nature of polyurethane foam makes it resistant to water penetration. Conformable: During the injection process the polyurethane foam will flow freely into cracks and voids, expanding to its final in-place density which is typically greater than its free rise density. Free rise density is determined without any loads or restrictions placed on the polyurethane foam.